I've had this the Ruggable in our mudroom for a year now. It is right in front of the dog door and our two large dogs bring in a lot of sand and mud. I can vacuum the Ruggable pretty much like a regular rug -- as long as I am careful around the edges -- or I can take the top off the backing and shake it outside. It also washes well. 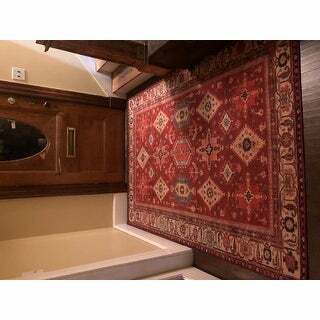 Several friends have been surprised that I would put "such a good rug" in the mud room. A beautiful washable rug. I am glad Ruggable exists; their rugs on top of vinyl planking and edged with an anti-chewwing spray have left our puppy frustrated. I think he'll get over it. This is my second Ruggable rug. If you have pets, it's a must have. With 5 cats and 2 large dogs, we had given up on rugs that cost too much to clean and had to be thrown away after a year. The only downside is that, if viewed closely, it's obviously printed but washability far outweighs. It also lays flat and is easy to vacuum. Highly recommended. 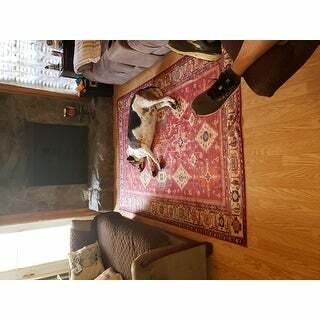 Love my Ruggable rug!! Looks amazing in my foyer!! Happy it's machine washable! Great item. Just received and put in the living room for my two French Bulldogs. They are rather ingenious for a pet owner who has animals that sometimes pee on carpets. We gave up on having any because we would clean and soak and spray, etc and there was inevitably a urine odor anyway. Bye bye house, hello garbage. Rather an expensive way to decorate. They are not plush, they have a smooth surface with the design looks great in our living room. Dogs have slept and rolled but not peed on yet. My washing machine is ready when they are! These washable rugs are terrific. We have pets and it's just impossible to keep the other rugs clean. They track in dirt and mud and we just end up frustrated. They aren't thick and plush, but they still look nice and we love being able to keep them clean. I bought this rug because a rescue dog I gave will pee on the rug instead of going outside if it’s cold or rainy, and pee pads are a hit and miss with her. I am quite surprised at how good this rug looks. I haven’t washed it yet, but installing it was easy, and actually no one in the family has noticed there is a different “Persian” rug under the table. Amazing quality. I was skeptical how a ‘polyester’ rug and pad could warrant a price that I was seeing (even on sale). I am converted. 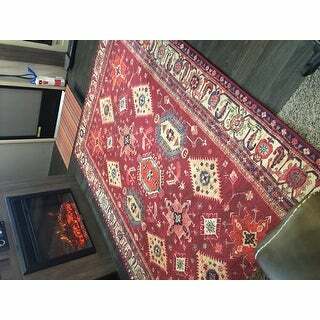 This is a beautiful quality rug and amazingly soft. The non skid pad takes a little tweaking to get it ‘just right’ but it takes our dog and my husbands work boots. The ability to wash is the icing on the cake. Perfect for RVs as well - pic is from RV. Beautiful rug! With the bottom pad stays secure on the floor. With Three dogs happy that the rug is washable. Quality is great, arrived well packaged. Very happy. I was skeptical of the "just throw it in the washer" thinking it would look thin, etc but the rug edge is over the velcro type base about 1/2" and you don't notice. I love it. Haven't washed it yet but I'll see how that goes! I bought this rug from *** at a higher price. It’s beautiful and everything everyone else has said on here. 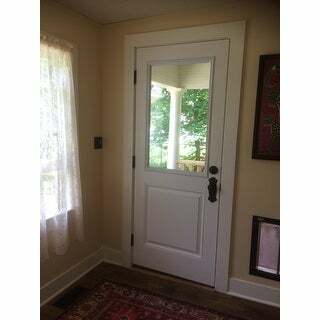 I got a smaller one for the door area and have been super happy with both. Having it washable is key when there are pets. Just received my rug yesterday, I was so excited! 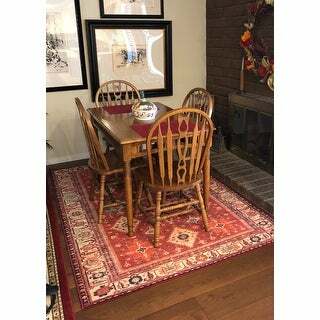 i have the same pattern in 3 x 5 in my front foyer and I put this one under my dining table. Couldn't be happier! It's perfect! Beautiful design and quality. I was nervous ordering a washable rug but with two dogs I decided to do it. Very glad I did! Very soft to the touch - colors are a little more orange than pictured. Haven't tried washing it yet. I love Ruggables. I have a number of them and rotate between them weekly. Our dogs have ruined a number of nice, wool rugs, so, it's great to have these machine washable rugs. Looks quite luxurious. Will buy more ruggables. Oh this rug! It is such an amazing idea. So soft, great designs and so easy to put down. I can’t wait to not stress out about stuff getting in it and me needing to throw it into the washer. I selected this rug to test it for outdoor use in my back yard and see how it holds up against my dog. 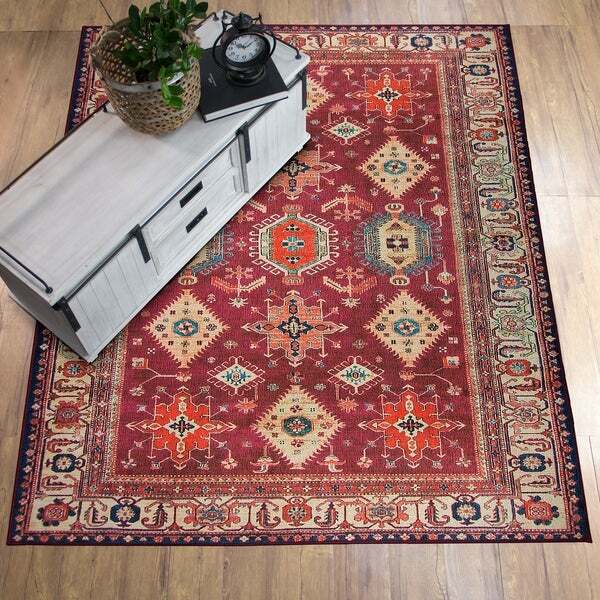 Safavieh Vintage Hamadan Traditional Red/ Multicolored Distressed Rug - 5'-3" X 7'-6"